All the inside pics & deets from the big fat Isha Ambani wedding! Asia’s richest man Mukesh and Nita Ambani's daughter Isha Ambani got married to Billionaire Ajay Piramal's son Anand Piramal last night and the everyone was glued to their screens waiting for the first pics to release. And when they did, people couldn't just keep calm. 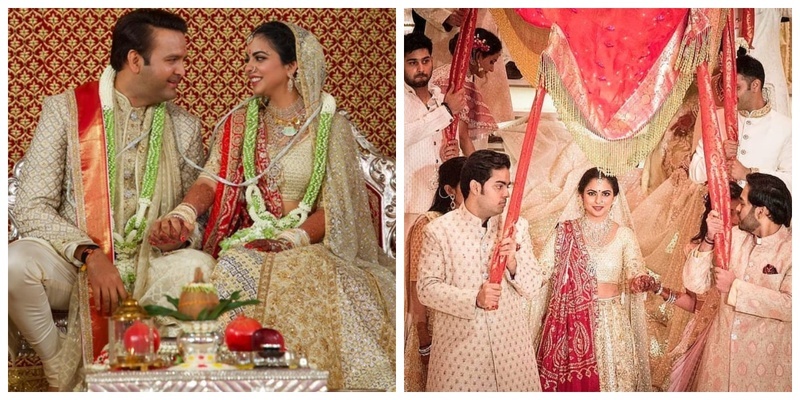 Isha Ambani took the traditional route and chose to wear a golden and beige Abu Jani Sandeep Khosla lehenga with a bandhani dupatta, giving it a Panetar look (a traditional bridal attire). She entered the mandap under a traditional chaddar held by her brothers, which also coordinated with her outfit! The couple chose to coordinate their wedding outfits in the cutest way ever, don't you think? Mr. Amitabh Bachchan voiced that fatherly feeling of 'what happens when a father has to give away his daughter', while Mukesh Ambani looked so emotional! The mother & father of the bride caught in a candid emotional moment, their expressions say it all! While these divas - (L-R) Shilpa Shetty Kundra, Gauri Khan, Sunita Kapoor and Rekha gave me ‘what to wear to a shaadi lessons’! Yes, I am taking notes. And if you think the wedding shenanigans for the Ambanis have ended, here’s saying a grander reception awaits for the newlyweds!